"A weirdly hieroglyphed onyx talisman, picked up in the street by the sharer of his dream, is shortly given the artist; and after stumbling queerly upon the hellish and forbidden book of horrors the two learn, among other hideous things which no sane mortal should know, that this talisman is indeed the nameless Yellow Sign handed down from the accursed cult of Hastur—from primordial Carcosa." 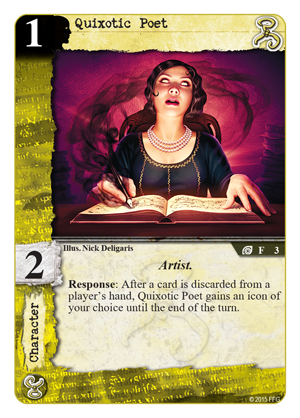 Artists work feverishly under the spell of profane influence. Musicians recoil from the eerie, cacophonic music they play, even as it pounds, lilts, tumbles, and tangles around them, weaving itself into their very souls. 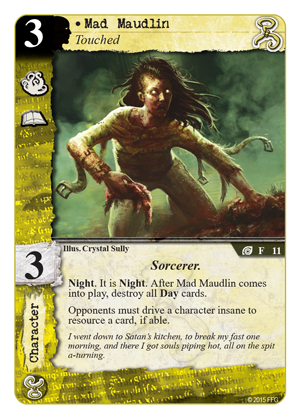 In Marseille, the lunatics have escaped the asylum and are running rampant through the city's gaslit streets, compelled by the dark and corrupting influence of Hastur, the malevolent King in Yellow. 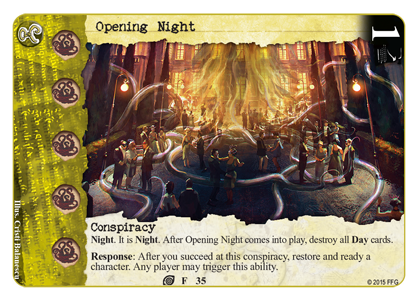 Also known as the Unspeakable One and He Who Is Not to Be Named, Hastur has long been one of the most popular Ancient Ones in the Cthulhu mythos, and his secret cult now gains a profane boost from The Mark of Madness deluxe expansion for Call of Cthulhu: The Card Game, available today at retailers throughout the United States and online via our webstore! 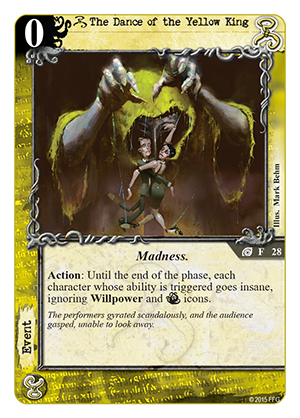 With its 165 new cards (three copies each of fifty-five different cards), The Mark of Madness elevates the game's focus on terror to an art form, offering a renewed focus on its iconic Terror struggle. 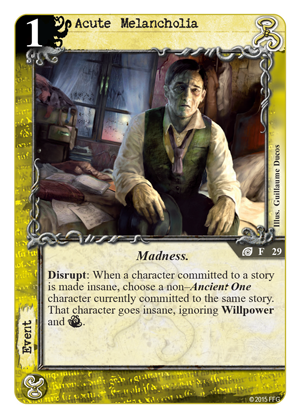 Additionally, a good measure of the expansion's characters, supports, and events further emphasize the mechanics for insanity that help make Call of Cthulhu: The Card Game the immediately distinctive, eerie, and supernatural Lovecraftian experience that it is. "I showed him a list of thousands of names which Mr. Wilde had drawn up; every man whose name was there had received the Yellow Sign, which no living human being dared disregard." 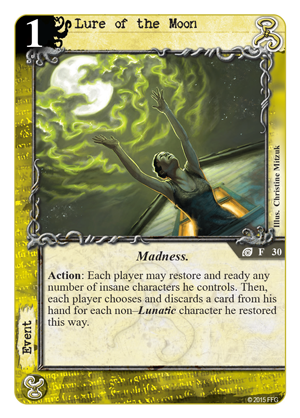 As the dedicated Hastur expansion, The Mark of Madness plays to many of the faction's longtime themes and strengths, supplying you with a plethora of new options to reinforce and reinvigorate a number of strategies that harken all the way back to the game's origins. 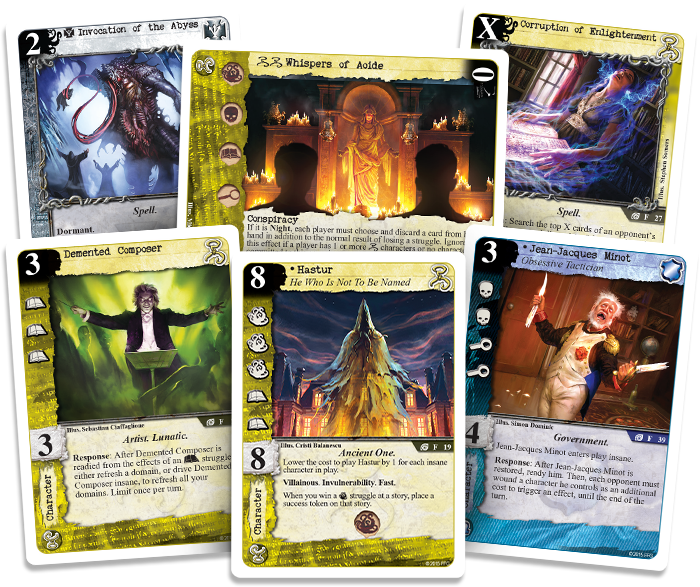 Long ago, shortly after the release of the Core Set, top tournament players often paired Hastur's strengths in "control" strategies alongside the Agency's many tools for "rush" strategies. 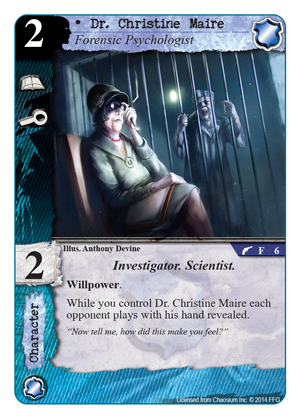 Those pairings are back, now that you can use powerful Hastur cards like Mad Maudlin (The Mark of Madness, 11) and Daughter of Atlach-Nacha (The Mark of Madness, 15) alongside newer Agency cards like The Blackwood Initiative (For the Greater Good, 35) and Dr. Christine Marie (For the Greater Good, 6). 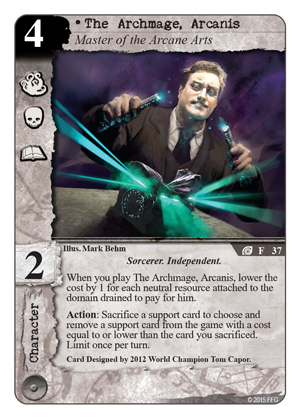 Of course, The Mark of Madness doesn't just enhance the classical, unholy union between Hastur's cult and the members of the Agency. It also presents all manner of tempting new abilities to subtly corrupt all the others of the game's factions. 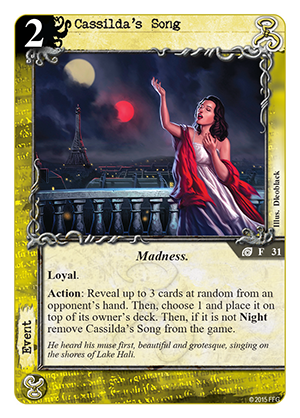 For example, you could use Cassilda's Song (The Mark of Madness, 31) and Seer of the Gate (The Mark of Madness, 55) in a deck that pairs Hastur's cult with that of Yog-Sothoth, or you could add Opening Night (The Mark of Madness, 35) to a Night-focused deck that makes use of Nightmares! 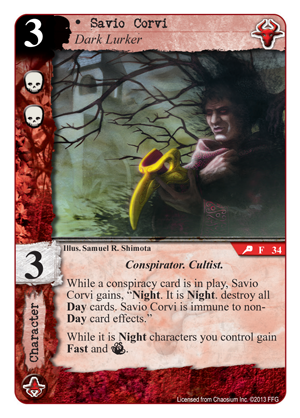 (Twilight Horror, 10) and Sweet Dreams… (Twilight Horror, 9) alongside Shub-Niggurath's infamous Conspirator, Savio Corvi (Terror in Venice, 34). 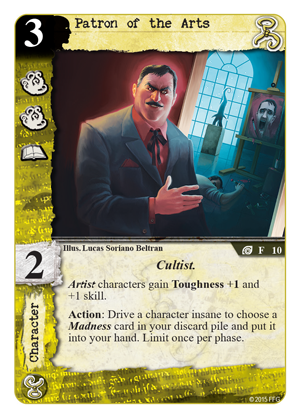 Yet as much as it promotes the exploration of these and other pairings, The Mark of Madness does even more to make Hastur's cult a truly terrifying force in its own right. 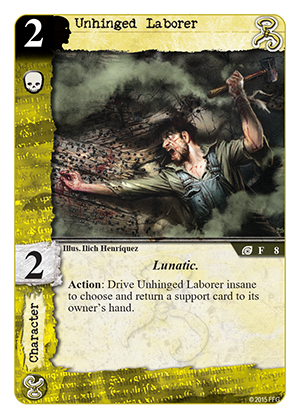 Unhinged Laborer (The Mark of Madness, 8), Tom O'Bedlam (The Mark of Madness, 12), and Lure of the Moon (The Mark of Madness, 30) add frightening measures of control to existing Lunatic strategies. 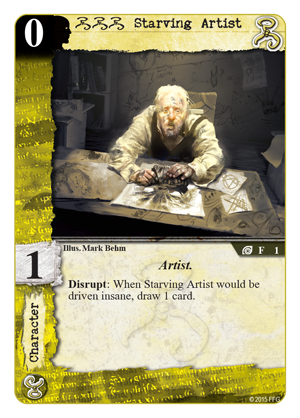 Meanwhile, Hastur's followers have always been a bit more artistic than the general populace, and the Patron of the Arts (The Mark of Madness, 10) willingly supports the expansion's new Artists, such as the Starving Artist (The Mark of Madness, 1) and Quixotic Poet (The Mark of Madness, 3), in their efforts to produce works of pure genius, even if their pursuits lend new strength to the idea that true genius borders on madness. After all, the Patron of the Arts, like the Artists he supports, is less of a player than he is an instrument in The Dance of the Yellow King (The Mark of Madness, 28). 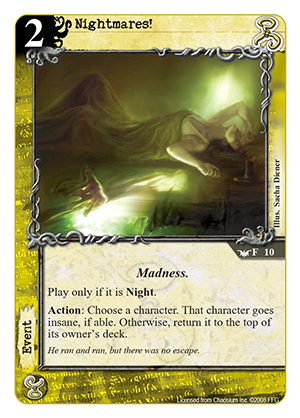 Because The Mark of Madness introduces such a potent chunk of madness for the King in Yellow to wield, it also makes an excellent starting point for any player looking to expand into or experiment with Hastur's often subtle and always manipulative methods. 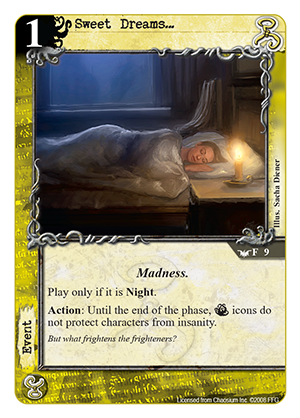 There are a good number of decks that you can build with just one copy of The Mark of Madness and one Core Set, and the expansion's inset includes one designed by four-time World Champion Tom Capor. 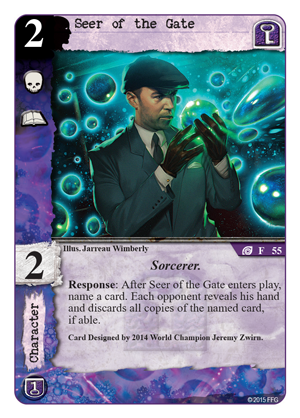 Mind-control, monsters, Madness, subterranean catacombs, and shocking transformations –– Tom's deck has it all, along with both of his new Champion cards and a short explanation of the deck's many eldritch secrets. In this world, you can be the one being scared, or you can be the one doing the scaring! 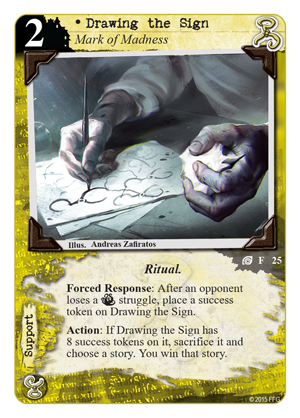 This "simple to play" deck utilizes its large amount of Terror icons to gain an edge with cards like A Scheme of Byakhees and Drawing the Sign. 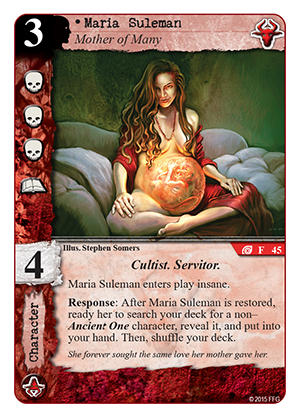 Cards like Maria Suleman and the Shadowed Woods keep the good times coming while cards such as Shocking Transformation and Thaumaturgical Insight give you the option to find the cards you need the most. In terms of playing the deck, don't be afraid to resource your high-cost cards in the early game. Prioritize defense as needed to stall the game until you can start playing your larger characters, which will, more often than not, be your path to victory. "I drew on the white silk robe, embroidered with the Yellow Sign, and placed the crown upon my head. 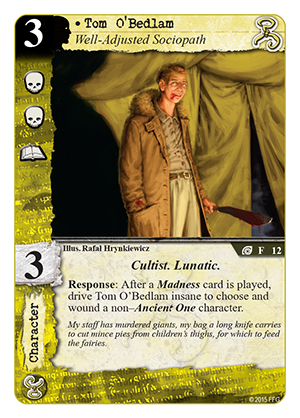 At last I was King, King in my right in Hastur, King because I knew the mystery of the Hyades, and my mind had sounded the depths of the Lake of Hali. I was King!" 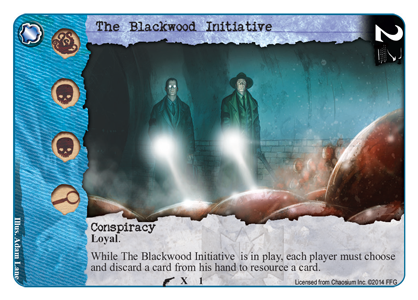 Over the ages, the Cultists and Investigators of Call of Cthulhu: The Card Game have engaged in innumerable struggles for control over the fates of forbidden tomes, arcane knowledge, and the secret rituals that could potentially rouse the fearful Ancient Ones from their deathless slumber. 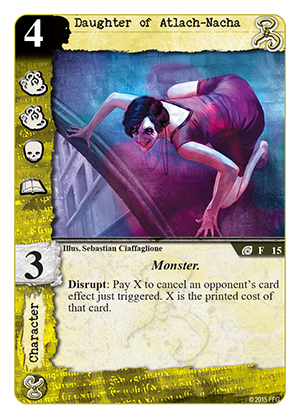 Over the course of nine deluxe expansions and seven cycles of Asylum Packs, their struggles have seen many driven mad, many more wounded, and others sealed into secret walls, pushed into the spaces beyond time and space, and transformed into foul Ghouls and other degenerate creatures. Now, The Mark of Madness pushes their struggles toward their final chapters. 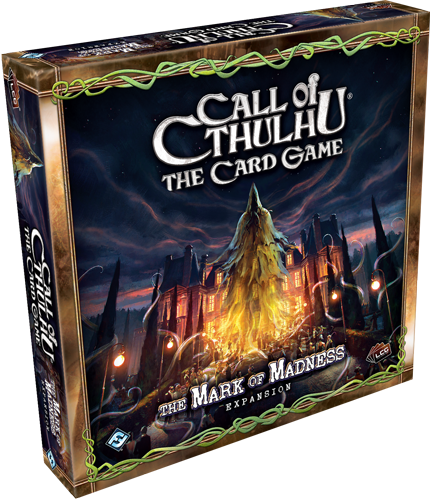 With its Ancient Ones and art and Spells and Relics, this tenth and final deluxe expansion for Call of Cthulhu: The Card Game swiftly and surely seduces and corrupts the most psychically sensitive individuals in Marseille, breaking their minds, breaking their wills, driving them toward madness, and epitomizing all of the thematic richness and all of the elegant and strategic gameplay that has long been the mark of Call of Cthulhu: The Card Game. Plunge yourself into the madness today. The Mark of Madness is now available at retailers throughout the United States and online through our webstore. Availability in other regions may vary.